In Spectre, the latest James Bond film, the legendary agent 007 is injected with "smart blood" containing tiny location-tracking microchips that are impossible for the enemy to remove. Bond films have always caught the attention of 23-year-old movie fan Nisal Subasinghe, as they feature technologies of tomorrow. "Seeing all the wonders nanotechnology could do in movies like Spider-Man, Iron Man and James Bond, it has always made me think how far we are to achieving such technologies in real life," said the recent graduate of the diploma in electrical and electronic engineering course at Republic Polytechnic (RP). 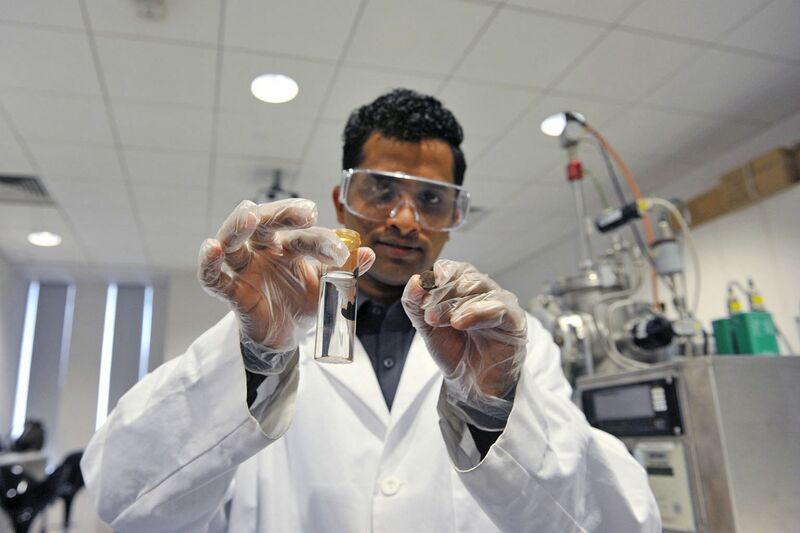 Mr Subasinghe, who investigated nano-structured anti-reflective and water-repellent glass in his final-year project, believes that a technology such as smart blood may become reality one day. "I picked nanotechnology so that I can be part of the future," he said. And he is on his way to realising his dream as he is due to start work at Micron Semiconductor Asia, where he will work on the production of nanotechnology devices. "I'm intending to learn more and more on this sector and complete my undergraduate course so as to secure my position in the competitive world." But not many students share his interest. Professor Thirumalai Venky Venkatesan, director of the National University of Singapore Nanoscience and Nanotechnology Institute (NUSNNI), said that not enough Singaporean students are going into science careers, as many prefer to become doctors, lawyers or businessmen. When he submits reports to the National Research Foundation for projects funded under its Competitive Research Programme, he is required to state how many Singaporean researchers have been involved. The answer is usually none. At the moment, there are no Singaporean PhD students or postdoctoral researchers at NUSNNI. That is a pity because, unlike other disruptive technologies featured in this series, nanotechnology is a force for job creation, not destruction. It is unlikely to automate anyone out of the work they now do. Instead, it creates new demand for workers with the training and skills in the field, one with great potential to improve people's quality of life. The right approach to overcoming the lack of interest in nanotechnology, Prof Venkatesan believes, is to enthuse Singaporean students to do science. This is why he hopes to start a programme for secondary school and junior college students to do stints at NUSNNI to experience cutting-edge nanotechnology research. A similar outreach programme was started in 2003 by Ms Noreena Abu Bakar, director of the Institute of Bioengineering and Nanotechnology (IBN) at the Agency for Science, Technology and Research (A*Star). To date, the institute's open houses and educational events have reached more than 95,000 students and members of the public. In addition, over 2,300 students and teachers have spent at least one month in full-time research attachments at IBN, with one-to-one mentoring in its Youth Research Programme, said A*Star. Over the years, 59 of the participants subsequently joined IBN. Although there has been some turnover, they still constitute a significant portion of IBN's staff strength, said IBN executive director Jackie Ying. There are other signs that nanotechnology is seeping into the consciousness of Singapore students. In the Hackathon@SG 2015 competition, Primary 4 pupils from Balestier Hill Primary School won first prize for creating a game in which the player controls nanorobots that eat bad bacteria in a human blood vessel. Judges said it was creative and "out of the box". Professor Andrew Wee from NUS' Department of Physics said: "Due to the broad range of industries (spanned by nanotechnology), most educational institutions already incorporate nanoscience and nanotechnology concepts in their courses." He added that the physics, chemistry and engineering degrees at NUS give students a strong foundation in the properties of nanomaterials, in order to prepare them well for future nanotechnology industries. Even more important is that the university educates its students in fundamental concepts that they can apply to rapidly changing technologies in the future. Diploma and degree programmes relevant to nanotechnology are available here. These include the NanoCore PhD programme at NUS and the diploma in nanotechnology and materials science at Nanyang Polytechnic (NYP), both launched in 2009. The NanoCore programme brought different kinds of nanotech facilities under one roof to facilitate problem-solving, while the NYP diploma followed a study of local industry needs. In the study, NYP interviewed and surveyed about 30 companies, and consulted government agencies and institutions such as the Economic Development Board, Spring Singapore and A*Star's Institute of Materials Research and Engineering. NYP found that a large number of applications of nanotechnology was in nanomaterials. The course curriculum was reviewed in 2014, when further inputs from the industry revealed an increasing emphasis in areas such as renewable energy and clean technology. Ms Song Sin Nee, programme chair of RP's diploma in materials science, said the school works closely with nanotechnology companies and research institutions to open up final-year project and internship opportunities for the students, as well as career options, to encourage students to remain in nanotechnology-related industries after the course. Associate Professor Martin Pumera from Nanyang Technological University's School of Physical and Mathematical Sciences said: "Based on my interaction with the industry and the fact that my nanotech-educated PhD students are immediately hired by international companies based in Singapore, I can say the industrial sector could use more of a skilled nanotech-educated workforce." Of his five nanotech-focused PhD graduates so far, four are working with Johnson & Johnson and international drug development company Covance in Singapore, while the fifth is now a research associate in the nanotechnology energy sector in Canada. Nanotechnology is no longer just a Hollywood fantasy for students here. At NUSNNI, graduate students and postdoctoral researchers come up with 70 per cent to 80 per cent of the ideas, while the professors support them, said Prof Venkatesan. "They are the ones who are really propelling our institute forward."